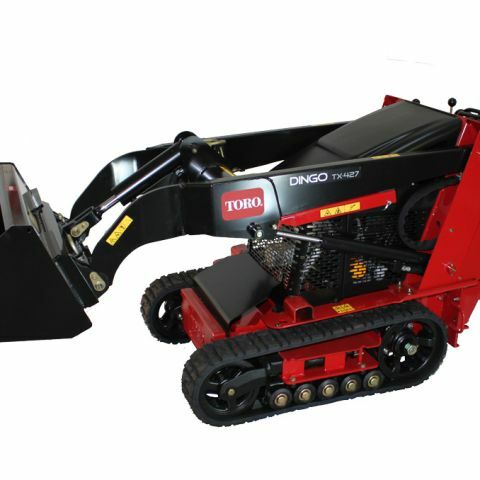 This easy to use and stable track-driven rental trencher cuts up to 24 inches deep and four inches wide. The TRX trenchers are powerful, simple to use, highly maneuverable and narrow enough to fit inside a standard gate. .. a hi-track system gives you better traction in wet environments, where a wheel unit would leave you slipping... combined with Toro's exclusive intuitive control system - provide the ultimate in performance and reliability. Can a trencher cut through gravel? The trental rencher is designed to go through hardpan and rocky soil -- and it is a very powerful machine, so you you can expect it to handle tough conditions, including gravel However, you may encounter some areas that you may need to loosen with a rental breaker or jackhammer. Will it trench out rocks? Yes, smaller rocks will come out along with the dirt as you work. As you work you'll get a sense of which rocks will trench out, and which rocks aren't going anywhere without a little bit of muscle, a pick and shovel -- or a rental breaker. How deep can I dig? 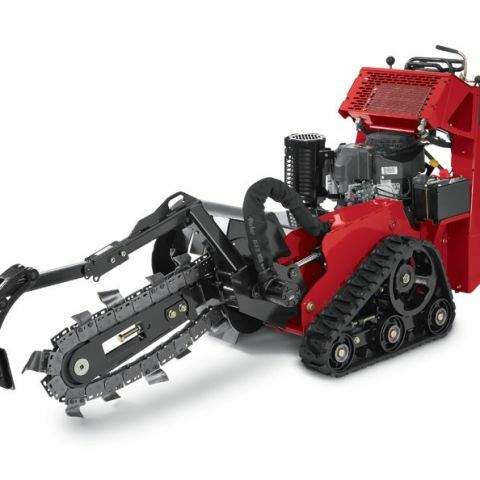 This model of rental trencher digs anywhere up to 24 inches deep and makes about a 4-inch wide trench. how fast will it trench? Trenching speed depends on variables of soil and the depth you're digging. But generally, if you are trenching at full depth, you can figure that you can trench a minimum of 100 linear feet per hour. Clear area of debris -- it's easy enough when walking your trenchline before you start to clear it of anything that might remotely cause a problem -- from sticks and rocks to any wire, scrap or cables, clear the line. A week before you plan to dig a trench, call 811 to inform utility locators, and schedule an inspection visit if necessary for water, electrical or gas lines. Before the inspection, mark the trench line you intend to follow. DO: Trench in reverse -- that's how the machine is designed to work. DO: wear eye protection.... it is unlikely anything will fly back at you but eye and ear protection are always a good idea. 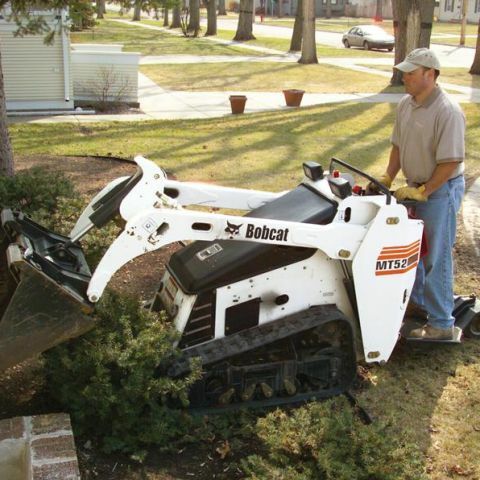 DON'T: Don't use a rental trencher in ground that hasn't been inspected for utility lines. Call 811, or contact your local utilities. DON'T: Trench alongside another trench. Possible results beyond safety concerns include tipping the trencher onto its side -- and getting a 1,000-pound trencher out of the trench and upright isn't something you want to attempt! DON'T: Don't attempt to turn the trench line while trenching at deeper depths. Make several passes at progressively deeper depths. DO: Use the power of gravity! If you are trenching on a slope, start at the top, rather than the bottom, and let gravity help you along. DO: Make sure the trencher is in good operating shape at the rental shop, but double-check on site to make sure the machine starts and can operate fully before putting the trench blade into the ground. DO: Create a safety radius around the machine and your job site -- family members and neighbors love to come watch you work. Part of your job as the operator is to keep them a safe distance away while the equipment is running. DO: Stay with the machine whenever it's running -- never leave it unattended! Also, when you are away from the machine, lower the boom/blade, turn off the engine and remove the key.